Given iOS Safari's baffling lack of a proper file management interface in 2015, I was relieved to see an update to Readdle's file management app Documents with iOS 9 support yesterday. Documents is a good file manager for iOS: its options aren't overwhelming, it lets you organize files in folders with decent search filters (unlike others), and now it can be used alongside other apps thanks to Slide Over and Split View. More importantly, it comes with a built-in web browser that, upon tapping download links, will bring up a downloader UI to start a download, choose where to save it, and monitor its progress. Since releasing our eBook version of my iOS 9 review yesterday, the question I'm being asked the most is how to download the .zip archive containing two EPUB files directly on iOS. The problem is twofold: readers need to download a .zip file and expand it, then choose to open one of the EPUBs in iBooks for iPhone or iPad. The main issue is that Safari seems to do nothing when tapping a download link (such as a link to a .zip file) in a webpage. 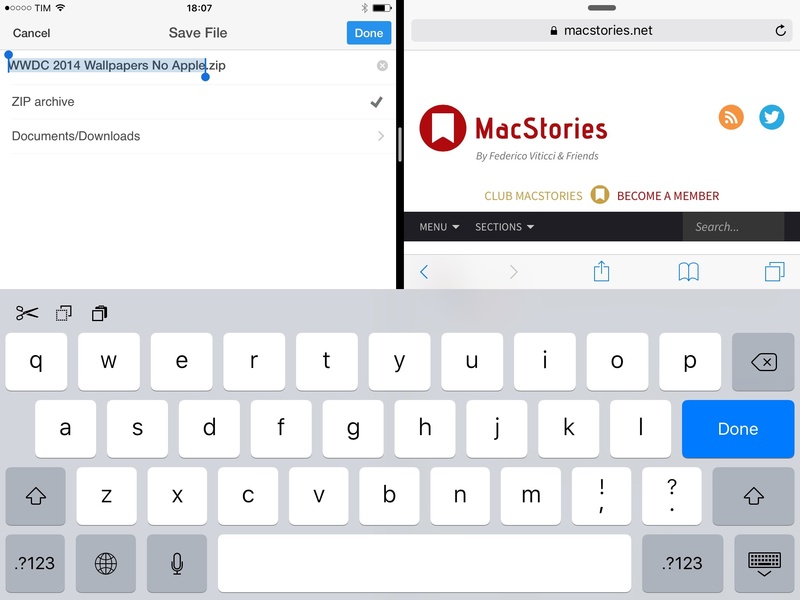 In reality, Safari starts the download invisibly in the background (something I mentioned in the past) without showing any indicator or progress bar: if you leave the tab open long enough, the download will eventually complete and show you an outdated Open In menu to send the downloaded file to another app. In our case, because the .zip archive is well over 100 MB, tapping its download link in Safari may result in nothing showing in the browser for several minutes while the download is actually happening in the background, without the user knowing. For this reason – and this goes beyond our eBook – I recommend using Readdle's Documents app to download and manage files on iOS 9: it's been updated for iOS 9 multitasking and search, it has a web browser with a downloader feature, and it's free on the App Store.